When you come across a marketing message that rubs you the wrong way, what’s wrong with it? Often, it’s that the message comes across as slick and pushy, or that it seems to have been generated in a vacuum without any consideration for the audience’s trending tastes, attitudes, and sensibilities. This impersonal, aloof vibe is unfortunately all too common on corporate social media accounts, and it hurts the branding and image of the business that is unintentionally giving off this vibe. One of the simplest, most effective things that any business can learn about social media is how to come across as genuine and personal when using it. But this is easier said than done with corporate social media. So what can your company do? Your corporate social media accounts are not just for pushing out traditional marketing and sales messages constantly. It’s a dynamic, multi-purpose system with thousands, and potentially millions of eyeballs on it. So the first thing to do is make sure you provide exceptional customer service on social media. Just like a customer who walks into your storefront expects to receive personalized, courteous, comprehensive service, so too should your social media accounts be exuding that same level of professionalism. The only difference is you’re doing it all online and can interact quickly. 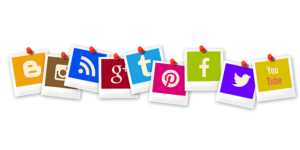 When your audience is scrolling through their social media feeds, your posts will be “consumed” within the span of about one or two seconds – and that’s if you’re lucky and your readers see your posts at all. So don’t use imprecise, muddled, jargon-filled words in your writing. Your audience won’t care if you tried to sound sophisticated or clever or smart; they will just skip right over you. The other challenge is, a brand account means your company needs to provide amazing value to start appearing more human and personalized. Your audience will get to know you over time, so invest in establishing a consistent, distinct company voice – one that will set you apart from your competitors. There’s no need to veer away from your company’s values or image; that will come across as inauthentic and forced. Rather, incorporate your company’s values and image into your voice. Is your corporate voice more authoritative or more friendly and playful? Is it more humble and personal or more clinical and direct? Does it sound more like something your teenage daughter would say or more like something the mayor of your city would say? These are all questions you must answer for yourself as you cultivate your corporate voice. This should be a no-brainer, but your audience can sense an advertisement or an aggressive marketing message from a mile away. Social media is your opportunity to be the leader in your industry and appeal to a savvy audience – don’t sabotage that effort by rolling out messages that will be an immediate turnoff to your audience. Of course, providing company updates, news, and occasionally information about products or services is fine, but your corporate social media feeds should not read like an ad billboard. Always do what you say you’ll do, and don’t mislead your audience. Create every piece of your social media content as if all of your fiercest critics and naysayers are watching your every move (because increasingly, they are!). It also can be challenging to build an authentic and trustworthy brand. That can take time to build and develop, but it takes a fraction of that to start losing credibility. Formulate your social plan, stay consistent, and above all stay true. It not only affects your brand image, but plays a role in sales and marketing results. Delivering an amazing experience through corporate social media accounts is not easy, but it can be done. While following the above will certainly create a better profile, feed, and connection to customers and prospects, there is a complementary way to help too. By encouraging and utilizing your workforce to share and join the social conversations via their accounts can add to the authenticity and help develop a genuine social brand. 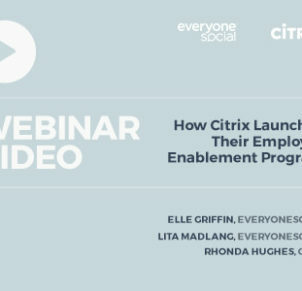 Typically called employee advocacy, this technique has been a growing need for many companies. Here are ten well-known brands doing this right now. 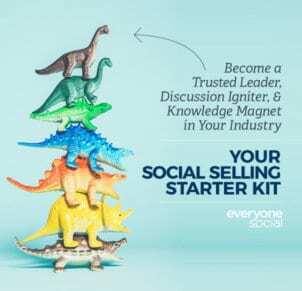 Your company should not encourage employees to push a sales agenda, or risk your team sounding like social spam-bots. 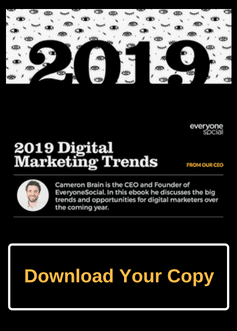 Instead, encourage company blog content, user-generated content, and third-party content that can connect with their audiences with credibility and knowledge. This has a profound impact on your company and builds a trust with the brand. Why should employees be social? Besides those above stats, people trust recommendations from friends, colleagues, and family over other forms of marketing like corporate social handles, ads, etc. Boosting your brand through employees can sound scary, but blocking them altogether from participation and getting digitally left behind is much scarier. Related: Your company should have a corporate social media policy in place that is accessible and encouraging for employees to get involved. Here are the best social media policy examples with a bonus template. 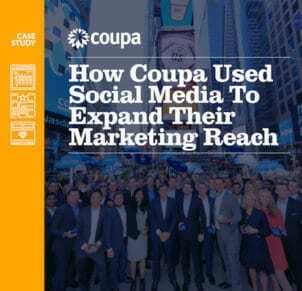 Corporate social media has incredible potential to reach huge swaths of the public for comparatively little time and money invested, but it also can become a liability for a business that isn’t savvy enough to use it effectively. That’s why it’s worth the investment to ensure your business is doing everything it can to come across as genuine and personal on your corporate social media accounts. Yet, you can also enhance the personable and genuine touch by exploring how employees can shape the corporate social narrative. 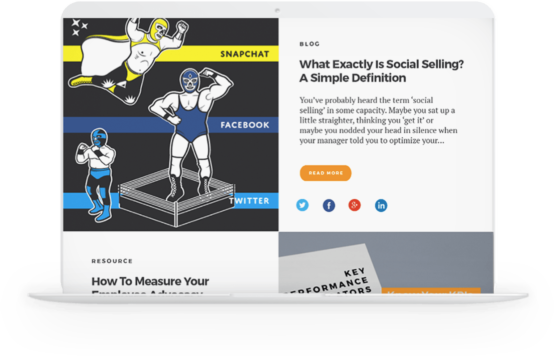 EveryoneSocial’s social media sharing platform makes it easier for companies to be genuine on all social media fronts because employees have the ability to share quality third-party content along with company content. 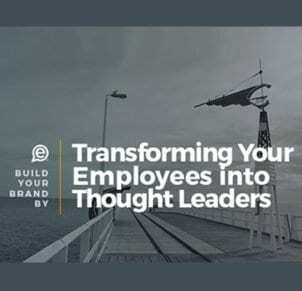 This helps organizations’ employees establish themselves as credible thought leaders with access to company and personal content, while not just sounding like company-trained bots. Not sure how you can start getting employees interested in social media marketing? Here are six tips that will ensure more active social participation.